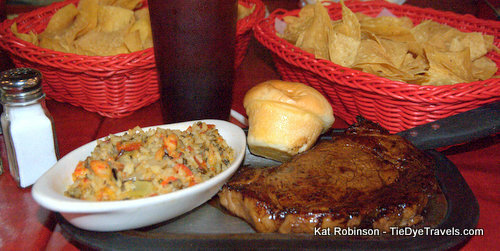 Steaks, Tex-Mex and Chip And Dip at The Cow Pen in Lake Village. At the foot of the new Greenville Bridge lies an old cattle inspection station that’s been renovated, burned out and renovated again. This is The Cow Pen, purveyor of some of the best steaks you’ll find in the Delta, and home of the Chip and Dip. Floyd Owens bought the old station back in 1967 and turned it into something new. He started a restaurant to serve the folks coming across the old Benjamin G. Humphries Bridge from Greenville. Ten years later he turned it over to Gene and Juanita Grassi, who would run it for thirty years. They served a mean steak… and they added some other ideas too, ranging from catfish to Mexican fare to the Italian dishes popular in the area. The Grassis decided to retire in 2007, and handed the reigns over to Charles Faulk and his family. Sadly, six months later the place burned out. That didn’t deter the Faulks, who dove into the task of rebuilding it bigger and better. And since reopening in November 2008, the place has flourished. You can’t really get a seat in the place Friday and Saturday nights, not right away at least. 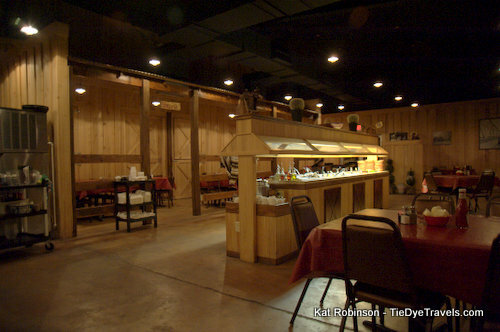 Within the wood-clad walls of the place folks pack out every section, the random diner at the salad bar from time to time, everyone talking and laughing and reminiscing. I’ve seen parties there of grown men with the charisma of little boys, telling stories and bragging over the steaks. I’ve seen elegantly dressed individuals pile in after weddings and gamblers who’ve crossed the bridge looking for something that’s not served in a casino. away from the crowds. We'd both planned to eat light, but the moment I saw Eggplant Parmesan listed on the menu (as a side dish, even!) I knew it had to be mine. I went ahead and ordered it with an entrée of Fried Clam Strips. 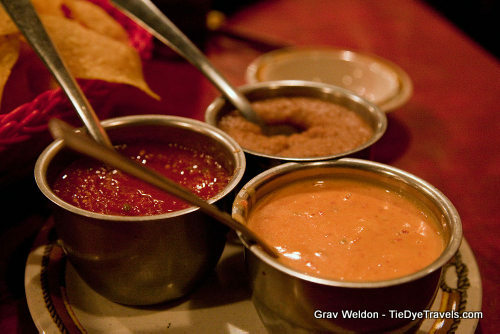 Grav was going easy on things, so he just went for the Chip & Dip -- which turned out to be three six ounce containers of dip and a basket about 14” long full of thin (but not too thin) crispy fried yellow tortilla chips. 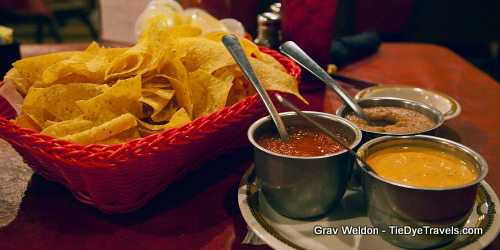 The cheese dip was a pretty standard Rotel-based dip, a bit better than the average. 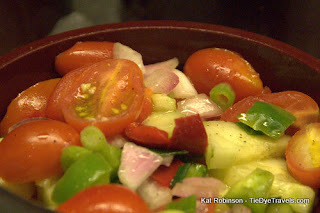 The bean dip was garlicky and had a very nice savory flavor of grilled onions to it. The salsa? 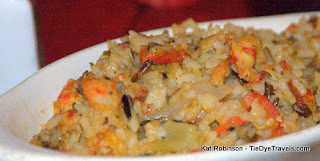 Out of this world, semi-sweet and tomato-y with lots of cumin in the flavor. I could have drank the salsa, seriously. My Eggplant Parmesan and the Fried Clam Strips came out shortly thereafter. The strips themselves were rather large for what I’m used to; nice hearty, meaty things with a slightly sweet cornmeal-and-flour breading. Best part — they didn’t smell or taste fishy. They were smooth, not rubbery, and had a great mouthfeel to them. They came with this dip that appeared to be Tartar sauce but which came closer to a Remoulade, a creamy sauce full of dill and pureed sweet pickles, paprika and cayenne pepper and more than a hint of horseradish sauce. It was a pleasantly wonderful balance, and Grav kept stealing them off my plate. Not that I could say anything — since I kept reaching over and helping myself to his Chip & Dip. The real winner for me, though, was the Eggplant Parmesan. I’ve had the Italian restaurant equivalent time and time again and been either just satisfied or disappointed. This, though, was almost an eggplant lasagna with well-baked eggplant slices between the layers of ricotta and mozarella cheese and a sweet and chunky tomato sauce. It wasn’t just fork-tender; it was press-down-with-your-finger-and-cut-it tender. And it was delightful. Now, you are probably wondering how we could go to a place like The Cow Pen and not order a steak. Well of course I have tried the steak at the Cow Pen. How could I not. While I typically go for the traditional sirloin, the restaurant's oversized 16-19 ounce ribeye is pretty good, and its Cow Pen Special (same steak but marinated in the house special sauce) is singular. There are some who swear by the 12-14 ounce filet as the best you'll find anywhere, but I have yet to spend the $50 to get it. 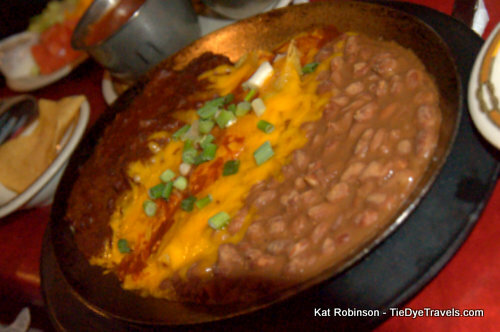 The Cow Pen also does Tex-Mex style dishes, namely quesadillas and fajitas, tamales and enchiladas. It has an entire Italian section on the menu and is dotted with Louisiana specialties such as crab cakes, catfish Orleans and shrimp Etouffee, the latter of which is a side item that I almost always get with whatever meal I choose to consume that night. There's also a salad bar, and I would be remiss in not pointing out the excellent tomato and cucumber salad. You shouldn't miss The Cow Pen. It's on the right before you go over the new US 82 Bridge. Give it a shot. Any Tuesday through Saturday night (or any Sunday lunch) you may chance and see Big Charles and Teresa, Little Charles and Lydia, Ed, Cookie, Angela, Jose, Bill or Sue Anne. Everyone’s on a first name basis and you might as well be home. 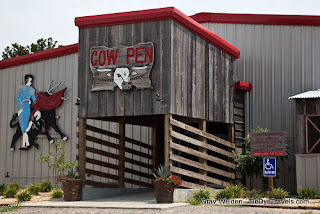 For more information, head over to The Cow Pen's website. We always say we are going to stop here, but we haven't. This calls for a road trip! I just recently came across your blog while I was looking for the recipe for Old South salad dressing, and I just wanted to let you know how much I enjoy your blog. I'm a native Arkansas girl and grew up in Atkins and lived in Little Rock as adult. I live in Oklahoma now, and although I go "home" to visit friends and family, reading your blog really helps me when I get homesick and want to take a little trip home. Thanks for the memories....keep up the great work! Secret Romantic Hideaways Across Arkansas. Lunch Gorgeously at Sue's Kitchen in Jonesboro. 94 Years and Counting for Skyline Cafe in Mena. The Ps and Qs of Delta Q in Forrest City. The Ohio Club, Arkansas's Oldest Bar.